Facing ongoing economic and social challenges, Guinea’s infrastructure, equipment and skilled staff are scarce and unevenly distributed across the health system. 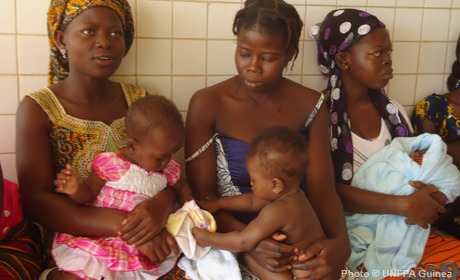 A large number of girls become mothers before age 17 and limited maternal health services help explain high rates of maternal mortality. UNFPA supports reproductive health services with programmes on essential obstetric care, adolescents and youth, family planning and health commodities . Other initiatives help to produce high-quality data for national policies and programmes, and establish mechanisms to respond to gender-based violence.